London, England (CNN) -- Scientists have uncovered startling new evidence which definitively show what color feathers certain dinosaurs had -- reddish-orange. The evidence also proves that feathers evolved in dinosaurs before birds adapted them for flight. "This is the first direct evidence of a certain color in a known dinosaur feather," Patrick Orr, co-author of the study from Bristol University told CNN. "If I had to explain it simply, I would say that we now have a basis for choosing a certain color if you were coloring in a dinosaur book. The discovery was made by a team of scientists from China and the UK, who used electron microscopy technology to analyze membranes in fossilized dinosaurs to determine what color the feathers were. 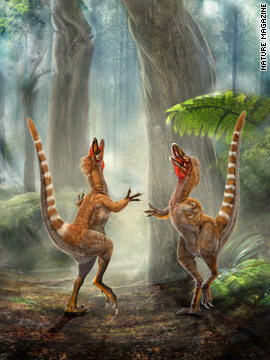 They examined the fossilized remains of the Sinosauropteryx and Sinornithosaurus which were discovered in October 2009 during a dig in northeast China. There, scientists found 20 fossilized pterodactyls dating back more than 160 million years. In early January 2010, another group of scientists found the oldest fossilized footprints made by a four-legged creature. The discovery of the footprints in a former quarry in the Holy Cross Mountains in southeastern Poland are thought to be 395 million years old -- 18 million years older than the earliest tetrapod (a vertebrate with limbs rather than fins) body fossils. The report says the footprints of the tetrapod measure up to 26 centimeters (10 inches) wide, which scientists say is indicative of an animal around 2.5 meters (7.5 feet) in length. The footprints are also 10 million years older than the earliest known elpistostegids -- creatures which displayed some animal characteristics but retained fins.